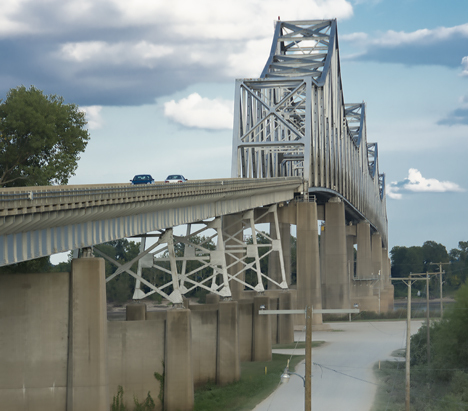 A long lens view (35 mm equivalent about 400mm) “foreshortens” (that’s the artist’s term for a proportional squeeze) the Mississippi River Bridge at Helena, Arkansas late in the day September 28, 2014. Click the pic and go to Elaine, Arkansas for a fine Delta Sunset at Corndancer dot-com. Several years ago, a tow boat pilot mistakenly steered his barges into the bridge on the Arkansas side. Officials closed the bridge for repairs to general traffic, but set up shuttle buses to take people across the bridge (there’s a casino at the Mississippi end). They also allowed people to walk across the bridge. Believing this would be the single chance in my lifetime to walk across the Mississippi River, I hoofed it. It was a great experience that few others have enjoyed. That was way back in the film days. You are seeing but one picture this week. I returned from the picture/info gathering foray about 9:30 p.m. this evening, far too late to begin previewing 1,100 plus images from the day′s shoot. So you get this one. Come back next week for the regular dose of images and verbiage. Before you split, be sure and check out “Evening in Elaine,” a look at the small Delta town bathed in a fine sunset. 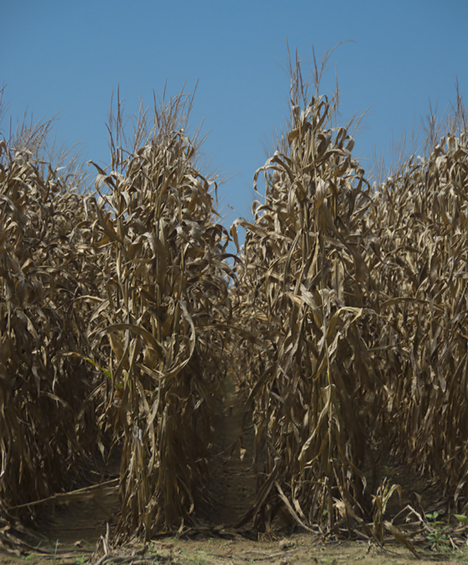 Check it out on the Photo of the Week page at Corndancer dot-com. 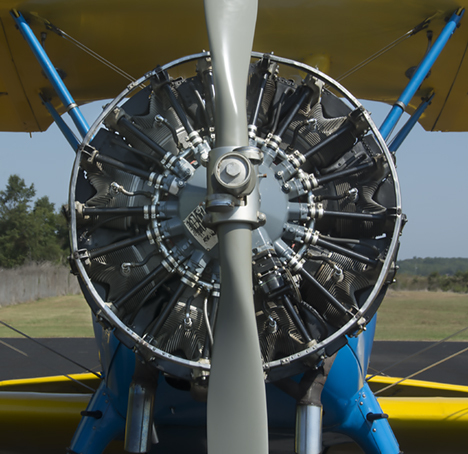 The annual fall fly-in at Grider Field in Pine Bluff, Arkansas features well restored, fully operational airplanes. One of the favorites is this fine Stearman. Click the pooch to more dogs, airplanes, and fun times at Corn Dancer dot-com. Saturday, September 20, 2014, there was more going on in LA than you could shake a stick at. 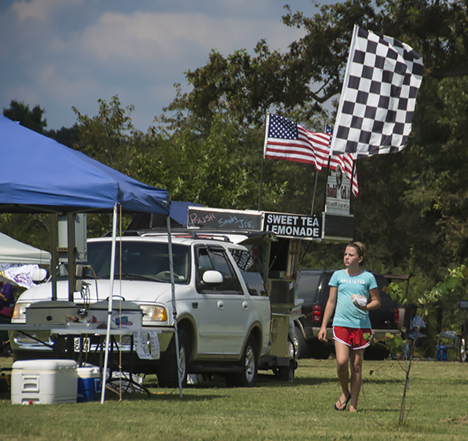 Grider Field in Pine Bluff hosted a fly-in airshow, the parking lot of Tractor Supply in White Hall hosted a Dog Wash and Bake Sale presented by Pine Bluff Animal Friends, and down the road a piece, in Dumas, Fun Day wrapped up the week-long Ding Dong Days festival. Now in the overall scheme of things, considering wars, pestilence, politics, IPOs, massive drug raids, NFL miscreants, the heartbreak of psoriasis, and new gadget introductions — these LA happenings may not sound like much — but to those involved, they are a big deal. That said, they are also a big deal to us. Pffffffft to the alleged big issues, full speed ahead in LA. Before we go much further, we recommend that you check out the Photo of the Week page at Corndancer dot-com where this tale started. You’ll see airplanes, dogs, and fun times. 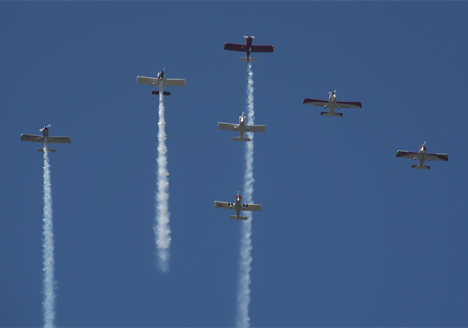 The Razorback Chapter of the Experimental Aircraft Association of America hosts an annual fly-in air show at Grider Field in Pine Bluff, Arkansas each September. 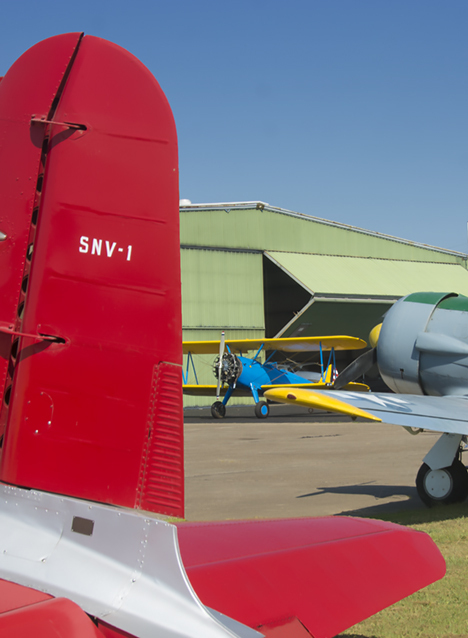 A regular feature of the event is a gathering of small high-performance aircraft whose pilots demonstrate precision formation flying and sometimes an aerobatics show. It is a great opportunity to see a great performance by skilled airplane drivers, most of whom built their own aircraft from kits. Pilots are showing their well practiced formation flying skills in their custom-built, tricked-out, aerial hot-rods. The Stearman is framed by the tail of a Vultee BT-13 and the nose of a North American AT-6. All three birds live at Grider Field. Pine Bluff Animal Friends, a support group for the Pine Bluff Animal Control shelter conducted a Dog Wash / Bake Sale in the parking lot of Tractor Supply at White Hall, Arkansas. 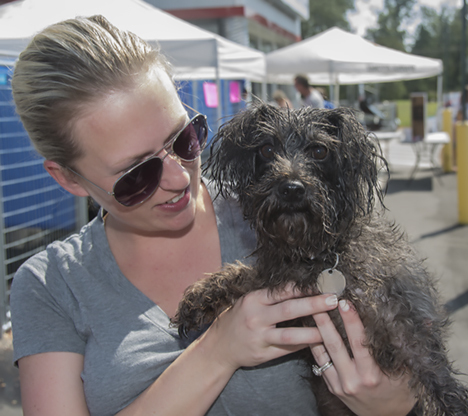 The event included dogs available for rescue adoption. Lots of wet noses and wagging tails. Fresh from the bath, this pooch appears to be glad the ordeal is done while the mistress is pleased to show off a clean companion. 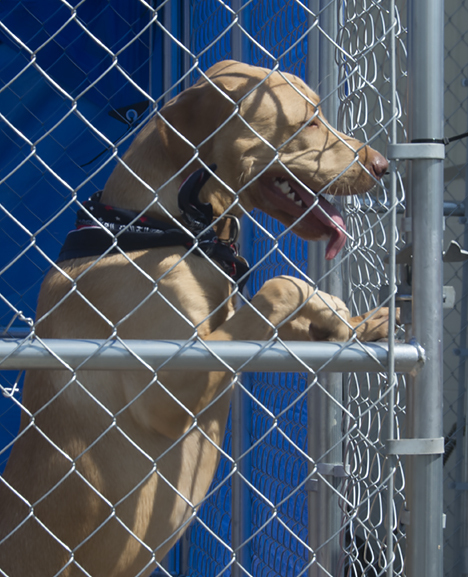 This friendly dog is, like others at the shelter, looking for a home. Our experience with rescue dogs and cats here at the Chez Dempsey is 100% positive. “Please take me home. I promise I’ll be good. 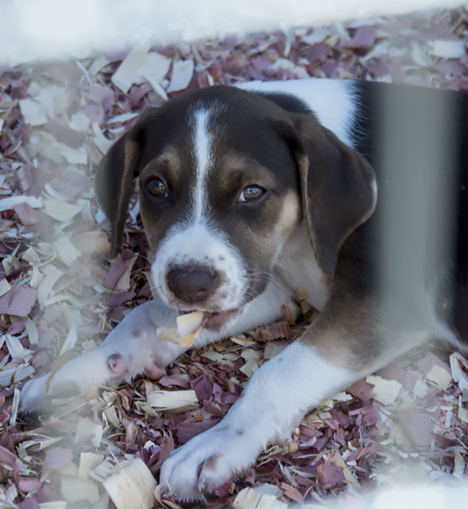 Please, please, pretty please,” this puppy seemed to say as his cage framed his face. The last stop in the LA triple play was Fun Day of the Week long Ding Dong Days festival in Dumas, Arkansas. These folks know how to put on a successful event which is fun for all. The event has everything but the kitchen sink on its agenda: An annual dinner, a parade, a pageant, a 5k run-walk, a barbeque contest, a horseshoe tournament, a cake walk, inflatables, a car show, rock climbing and more. On their web site they say they are a “progressive southern Delta town.” They are telling the truth. We, however have fudged. Three of the pictures below are from Friday, but what the heck, that’s close enough. Dumas has an active group participating in the Samaritan’s Purse Operation Christmas Child. They have “marching shoe boxes” every year in the parade. 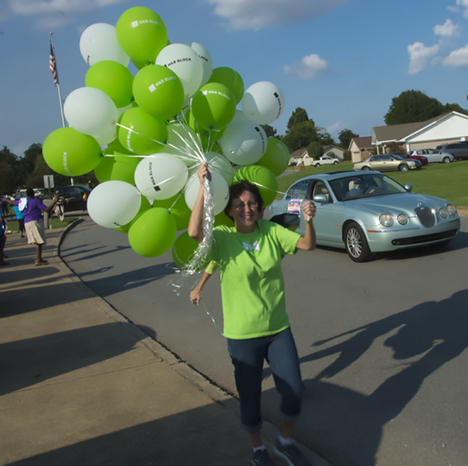 What’s a parade without a bunch of balloons. Go girl! The Ding Dong Days Festival includes the Dumas High School Homecoming festivities. 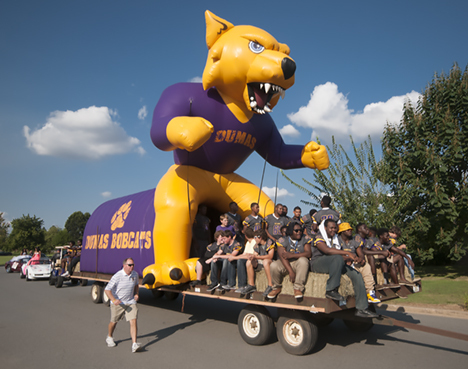 The giant inflatable Dumas Bobcat adds immeasurable panache to the parade. 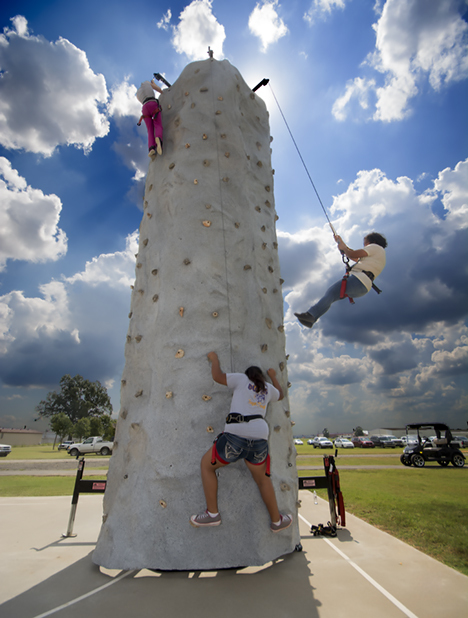 These three intrepid rock climbers show their stuff at Ding Dong Days Fun Day. 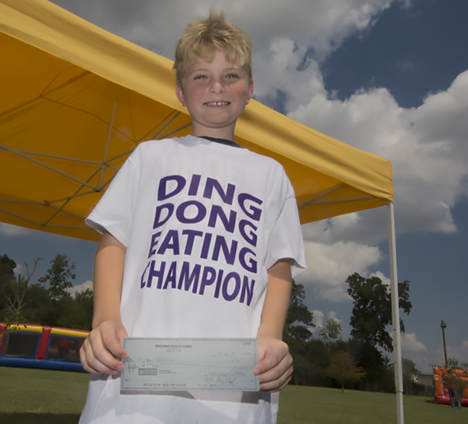 The Ding Dong Days Junior Eating Champion has a full tummy, a tee shirt and a fat check for his winning efforts. Folks, it don’t git much more southern than this. American flags, winners flag, sweet tea, lemonade and a youngster with a “basket” of sumpin’ fried, with the “Road Kill Grill” in the background. (Please forgive the gratuitous colloquialism. Under the circumstances, it just seemed correct-like). 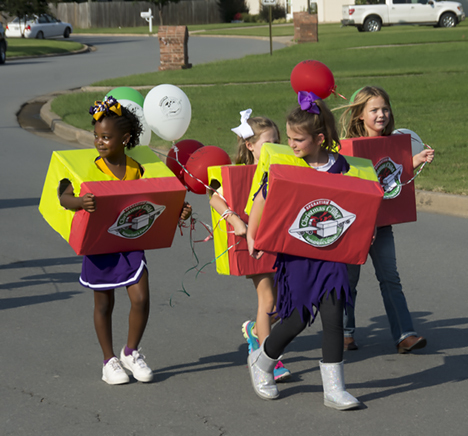 See the Dumas web site parade and fun day galleries for the bigger visual story. Click below to suit your fancy. There you have it in a shade less than a 100 mile round trip, a taste of a day in LA. Ain’t life grand?! 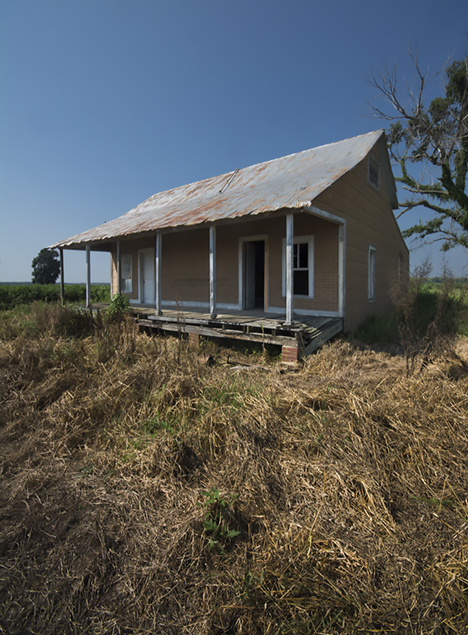 This old farmhouse at Pickens, Arkansas is the archetypical Delta farmhouse of the early and mid twentieth century. Most did not have indoor plumbing or electricity. This trip began with the specific purpose of revisiting a site I visited the last of June this year. The subject was this old farmhouse east of Pickens, Arkansas on Desha (pronounced Dee-shay) County Road 20. Lighting conditions on the first visit were less than stellar, but pixel implantation saved the day. I resolved to return in more favorable light and today (September 6, 2014) was the day. Milky overcast skies evident on the trip to the site miraculously cleared about the time I started to shoot. You can see more view of the old house and the rural Delta environment where it lives on the Photo of the Week page at Corndancer dot-com. If you lived here back in the day, this is more or less how it looked in your front yard and beyond. You did not have to walk to work, You lived in your job. One exception. The white plastic irrigation tubes would not have been there. 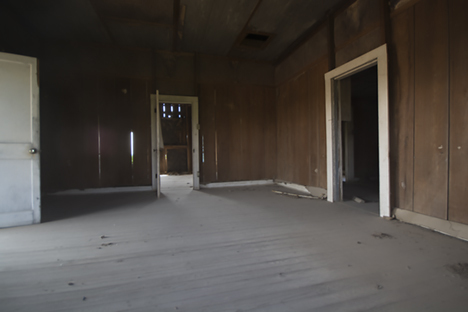 The two front door configuration might lead one to believe that the house was originally a dog-trot. Taking a look at the inside leads one to believe that what you see is how it started. Take a look at the size of the planks that make the walls. They appear to be more than a foot wide. This is the archetypical early and mid twentieth century Delta farmhouse. In their latter years, they were used more by farm hand families than the farm owners, but many started as a residence for the owner of the property. 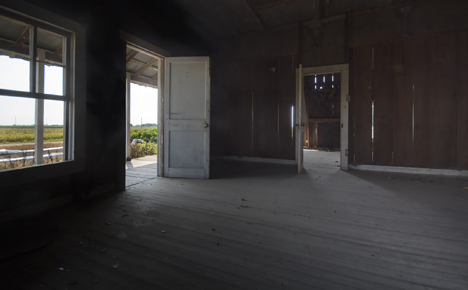 With two front doors, it appears that it might have started life as a dog-trot house, but a glimpse inside one of the windows makes me believe this is the original configuration. I have not been able to find out much about the history of the old house other than the fact that is is constructed of cypress. That is probably a contributing factor that, despite the harsh winds and weather of the Delta, the old structure is still standing. Few woods resist the nasty temper of weather better than cypress. Having satisfied the urge to record the old house, I sallied forth to see more of LA. But before I left, I had to yield to oncoming traffic. There was no argument that this big boy, a John Deere combine, had the right of way. Look at the size of those tires. 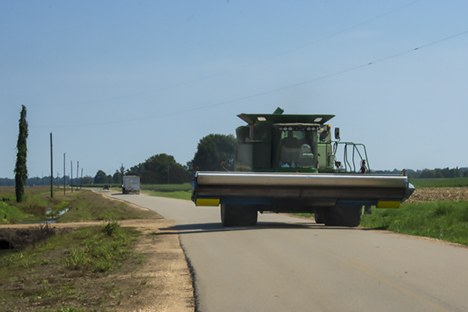 Once I was rolling west on Desha County Road 20 I encountered crops ready or close to ready for harvest. 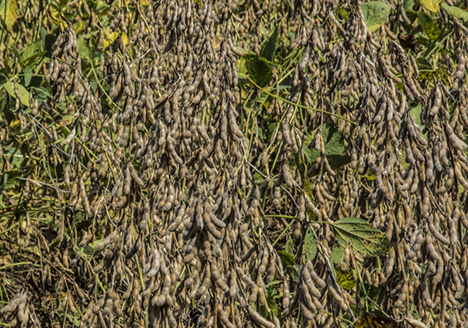 If you have never seen soybeans ready for harvest up close and personal, here they are. Next stop margarine (aka “oleo”), oil for your fries or a myriad of other uses for this wonder legume. 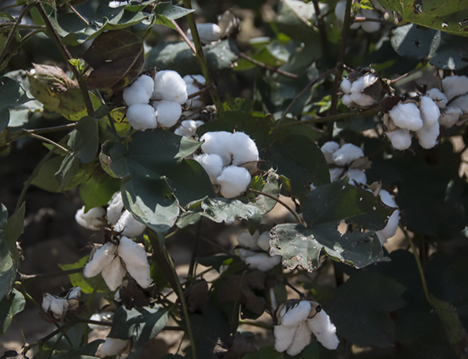 Though cotton is no longer the mainstay of Delta agriculture, you still find areas where farmers successfully raise the white stuff. 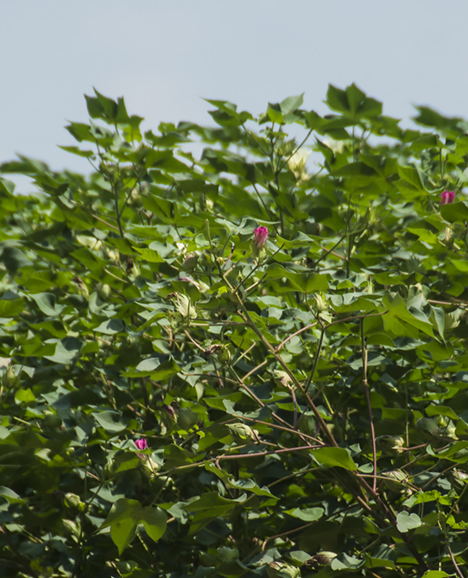 This healthy growth is showing blooms which will turn to bolls which will eventually produce cotton. The blooms you see here are pink, there may be white cotton blooms on the same plant. If you look closely you can see bolls which have already formed. When you stay on Desha County Road 20, eventually you cross the county line into Lincoln County and the road becomes Lincoln County 36 which eventually crosses Arkansas Highway 293. It was west of highway 293 that I saw my first open cotton bolls of 2014, a sure sign that fall is just around the corner. While I am no cotton expert, the first week of September is pretty dad-gum early for open cotton. Well into Lincoln County, east of Tyro on County Road 36, I found the first open cotton for 2014. I freely admit that while other cotton may have opened sooner, this is the first for me. So there! Corn is probably the “new cotton” here in LA. Where you formerly would see cotton fields that seemed to stretch forever, now you see corn. 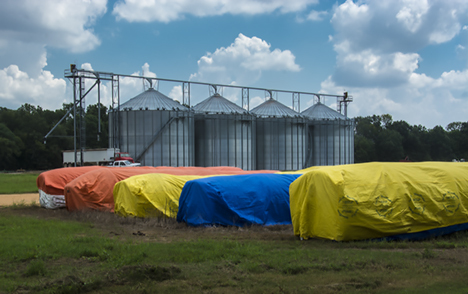 This field is ready for harvest. Giant combines will cruise through this field and others like it leaving scattered remnants of stalks and cobs — with their bellies full of corn kernels. 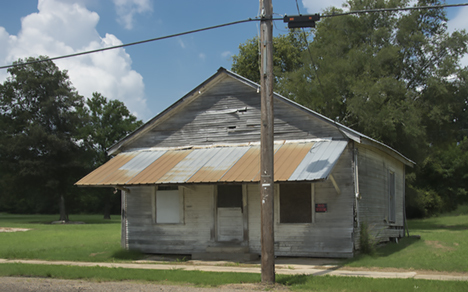 After my sojourn on county road 36, I came back to highway 293 to eventually take a swing through Winchester, Arkansas. 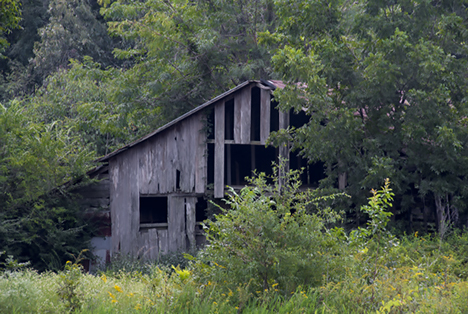 I saw little of great interest except for this old barn which looked like a good candidate for exploration. On second thought, since there was a pond in front of it (think cottonmouth habitat), chest high surrounding weeds, and a foreboding fence, I decided this might the the best and only view. In Winchester, on the main drag through town, you can see this old store with the ubiquitous “No Trespassing” sign. On the way home, I passed by “The Cross Tree” (the name I gave it). It stands as a living memorial by a family for a beloved relative who was murdered in a home that was on the site. 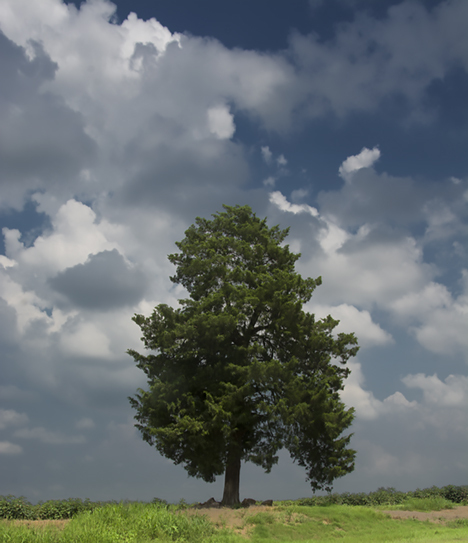 Read the Cross Tree story for details. There you have it. You’ve taken a swing through the Lower Arkansas Delta less mosquito bites, the price of gas, and bumpy gravel roads. That’s the sort of thing I do for my friends. Thanks for being one of those. 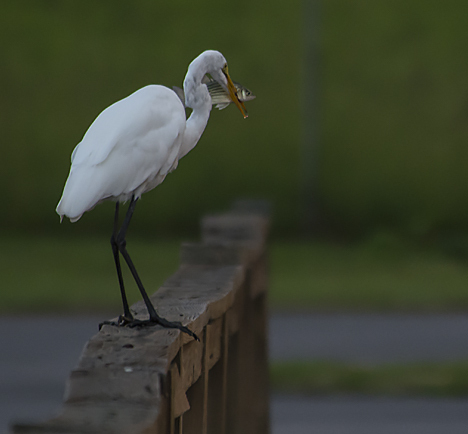 An egret returns to his perch after spearing his supper at Saracen Lake in Pine Bluff, Arkansas. 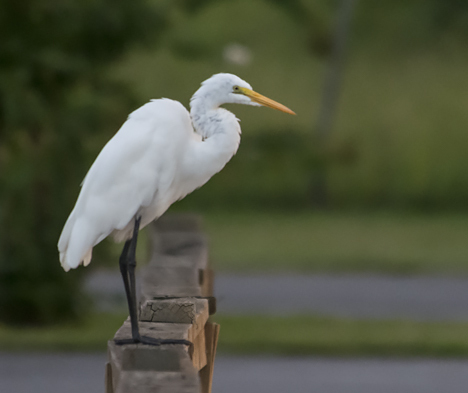 I noticed an egret on the dock — farther away than I would have liked. 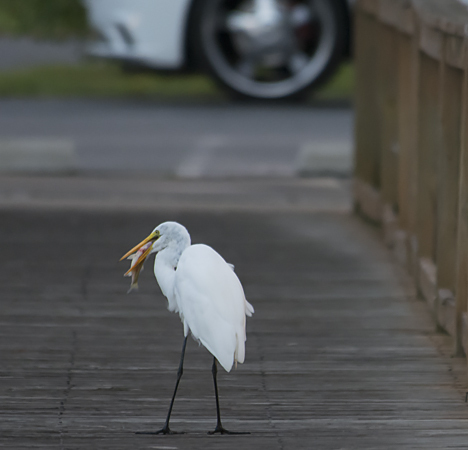 As I quickly snapped on a long lens he swooped down and away from the dock bannister at which time I uttered some rather derogatory utterings regarding his family heritage. To my grateful surprise, he returned to the bannister with a freshly speared fish in his beak. 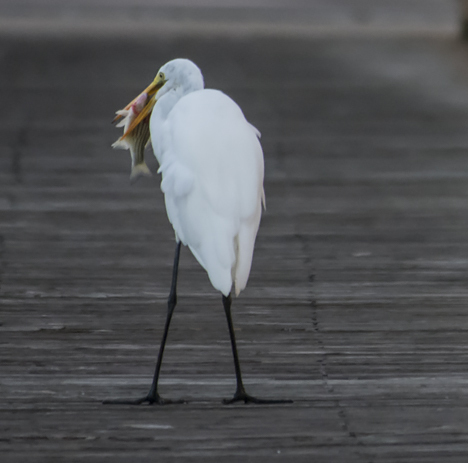 His next issue was unspearing his supper, picking it back up and getting it turned in the right direction to swallow. 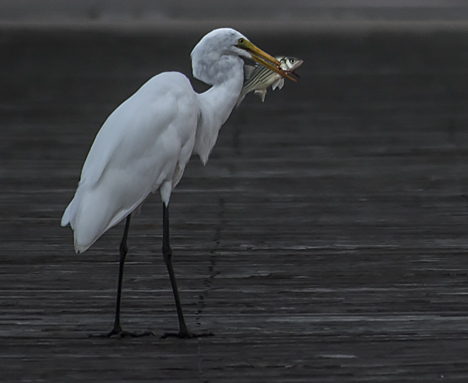 The egret hops down to the dock to start the ticklish project of getting his supper pointed in the right direction. He can do this over water, but he knows that the probability of success increases precipitously if he engages the process on a solid footing. 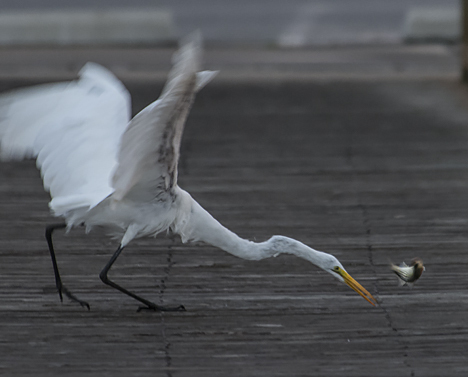 The egret jettisons his catch. Now he has to grab his supper again head first to facilitate swallowing his catch. 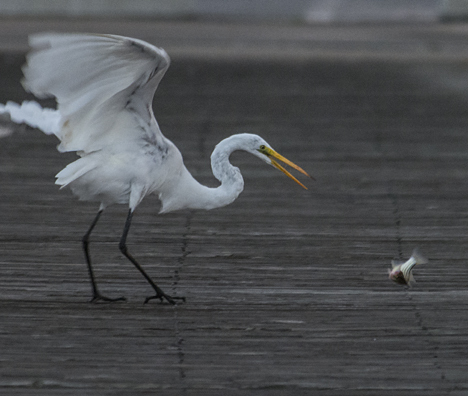 The egret misses the flopping fish on his first try. The fish, though mortally wounded, still has some remaining survival instinct and energy. Success at last. Bro. 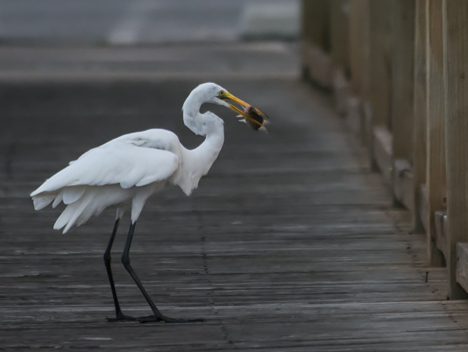 Egret has his fish again, nearly ready for supper. Even vehicular traffic does not disturb supper. 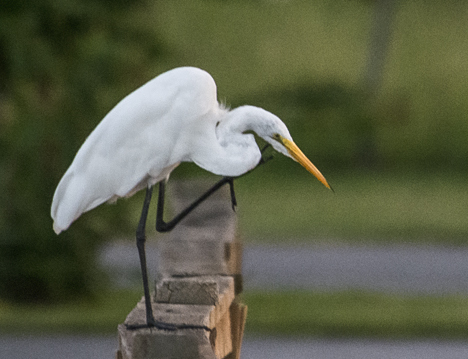 A bit of after supper preening and cleanup. Enjoying the view and relaxing after supper. And on the lookout for dessert. Before I went to the lake to shoot the sunset and ultimately the bird, I decided to take advantage of the favorable lighting conditions and shoot the Simmons First building here in Pine Bluff. 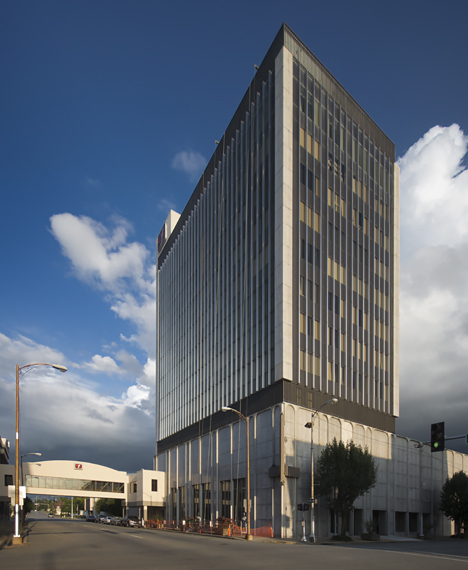 It is the tallest building in town and is home to the Simmons First banking operations. They are good corporate citizens and have been in business for 100 years and some change. Shooting the building under good light has been a long term “gonna” for yours truly and today was the day. The lighting was perfect and I fulfilled a long simmering desire to photograph the Simmons First building here in Pine Bluff. I would have preferred that the construction equipment not be in the picture, but lighting conditions are out of my hands, so we accept the archival nature of the image. Today was one of those “unexpected pleasure” days. I trust that you will experience a few of those in the next few days.